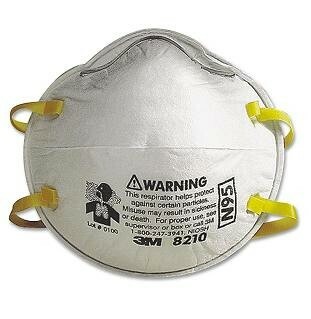 PRODUCT: 3M #8210 N95 PARTICULATE RESPIRATOR (FACE MASK) OSHA/NIOSH APPROVED. 20/BOX. PRICE/BOX. DESCRIPTION: 3M # 8210. Ideal for solid and non-oil based aerosol particles, this maintenance-free respirator provides a minimum filter efficiency of 95% making it ideal for grinding, sanding, bagging and basic processing of minerals and non-oil containing substances. With its lightweight design and adjustable nose clip for a secure seal, workers will readily wear this comfortable respirator without worrying about eyewear fogging. Electrostatically charged micro-fibers (Advanced Electret Media) make breathing easier and cooler. Use for: Solids such as those from processing minerals, coal, iron ore, flour, and certain other substances Liquid or non-oil based particles from sprays that do not also emit harmful vapors. Made in USA by 3M Brand. DO NOT USE FOR: Gases and vapors, including those present in paint spraying operations, oil aerosols, asbestos or sandblasting, aerosol concentrations that exceed 10 times the OSHA PEL, or applicable government regulation, whichever is lower. PACKAGING: 20/Box. Case qty is 160 - 8 boxes of 20 respirators/box.